The United States Sports Academy’s Awards of Sport series, recognizing “The Artist and The Athlete,” has once again honored a number of outstanding individuals for their achievements both on and off the playing field for 2009. The awards honor exemplary achievement in the arts, coaching, all-around athletic performance, courage, humanitarian activity, fitness, and media. The top athletes of the year are also honored. 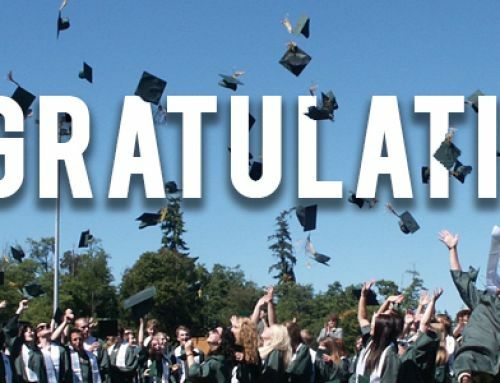 Please read on to view the accomplishments of the Academy’s Class of 2009. Brazilian Olympic Committee President Carlos Arthur Nuzman, left, poses for a photo with Peter Tichansky, the President of the Business Council for International Understanding (BCIU). 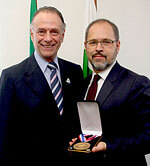 Tichansky presented Nuzman with the Eagle Award on behalf of the United States Sports Academy. Brazilian Carlos Arthur Nuzman was the individual most responsible for bringing the 2016 Summer Olympic Games and Paralympic Games to his home country for the first time in the history of Brazil and South America. Nuzman was a professional volleyball player from 1957 to 1972 and represented the Brazilian national team from 1962 to 1968. He was a member of the first Brazilian Olympic team in 1964. He is a member of the International Olympic Committee (IOC) and the Pan American Sports Organisation (PASO). Nick Saban has led the University of Alabama’s proud football program back into the national spotlight in his three short seasons in Tuscaloosa. Saban guided the Crimson Tide to a 14-0 record this season and a victory in the Bowl Championship Series (BCS) title game against Texas. Alabama advanced to the title game with a 32-13 victory over Florida in a lopsided battle between the Nos. 1 and 2 ranked teams in the country. Under Saban’s guidance in 2009 the Tide claimed its first-ever Heisman Trophy winner (running back Mark Ingram), featured the Butkus Award winner in linebacker Rolando McClain, and placed four players on the first-team Walter Camp All-American squad. Saban’s three-year record at Alabama is 33-8. Kelly Amonte Hiller was one of the most decorated college lacrosse athletes during her playing days at the University of Maryland. She’s on the same path as a coach after having guided Northwestern University to its fifth straight NCAA women’s championship. Northwestern is only the second school to accomplish that feat. The Wildcats went 23-0 in 2009 as Amonte Hiller improved her career record to 134-24. She took over the program when it was at club status in 2001 and has transformed into the NCAA’s preeminent program. University of Florida Director of Athletics Jeremy Foley, left, accepts the Carl Maddox Sports Management Award from United States Sports Academy Board of Trustee Member Jimmy Carnes. Carnes is a former Florida track and field coach and member of the USA Track and Field Hall of Fame. Jeremy Foley has seen it all in the University of Florida athletic department. During his rise from ticket office intern to his current role as director of athletics the Gators’ sports programs have been among the best in college sports. Under his guidance the school is the only one in history to win both the football and men’s basketball national championships in the same calendar year. Florida athletes have been successful on the field and in the classroom, with 13 national titles in all sports, and a combined 72 Academic All-Americans since 1992. Florida is also in the minority of BCS schools that are turning a profit in the athletic department. Dr. Robert Cantu is one of the world’s leading experts on concussions. He published the first ever return-to-play guidelines for sports concussions in 1986 and devised the first grading system for concussions based on symptoms at the time of injury (Grades 1, 2, 3) and provided medical professionals with concussion management guidelines where there existed none before. Dr. Cantu is a valued resource for reporters for stories on the National Football League and its continuing debate on the league’s policies on concussions and studies that link head injuries on the football field with brain disease. Dr. Gary Cunningham, a member of the United States Sports Academy’s Board of Trustees and a former UCLA basketball standout, presents the Dwight D. Eisenhower Fitness Award to “The Biggest Loser” co-hosts Bob Harper and Jillian Michaels. Bob Harper and Jillian Michaels have inspired millions around the world to improve their health and lifestyle through their hit NBC show “The Biggest Loser.” Since debuting in 2004, the show has audiences in 90 countries and is produced in 25 countries. In a show where everybody “loses,” “The Biggest Loser” challenges and encourages overweight contestants to shed pounds in a safe and recommended manner through exercise. The training of Harper and Michaels has also influenced those who watch the show to exercise along with the contestants. Tim Tebow is the youngest person to receive the Humanitarian Award. The Florida quarterback has been successful on and off the field. In addition to a Heisman Trophy and two national championships, Tebow has also been lauded for his work as a missionary in countries such as the Philippines, Thailand and Croatia. He also speaks at prisons, visits orphanages and leper colonies and is a hospital volunteer. Only a senior in college, Tebow has already raised more than $300,000 for charities and served 700 hours of community service. J.R. Martinez never quit on life, and there are many who are grateful he didn’t. After playing high school football in Hope, Ark., before transferring to Dalton, Ga., Martinez entered the military and sustained facial injuries that resulted in visible scars that couldn’t be corrected after 32 surgeries. Instead of hiding from his situation, Martinez became a beacon of courage for wounded warriors, helping them visualize the possibilities in life. He is also an actor on the ABC soap opera “All My Children,” portraying a veteran who is re-establishing his life in the civilian world. 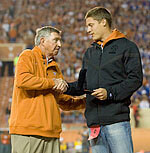 University of Texas Director of Athletics DeLoss Dodds, the 2003 winner of the Carl Maddox Sports Management Award, presents the United States Sports Academy’s Jim Thorpe All-Around Award to decathlete Trey Hardee at halftime of a Longhorns football game. Hardee is a Texas alumnus. Trey Hardee bounced back from a disappointing performance in the decathlon at the Beijing Olympics with a win at the International Association of Athletics Federations (IAAF) world championships in Berlin. Hardee, a native of Birmingham, Ala., and a University of Texas graduate, totaled a career-best 8,790 points in Berlin, and set personal records in three events: long jump, shot put and javelin throw. Lee Corso had a distinguished career as a college football coach, but it’s in broadcasting where he became a household name. Corso joined ESPN in 1987 after 28 years on the sidelines, and has become one of the more popular college football analysts in the game. He brings a mix of bold analysis and humor to his trade, including his signature moment, donning the headgear of mascots to reveal picks on ESPN’s College GameDay show. Daniel Rooney spent literally his entire life with the Pittsburgh Steelers, from ball boy to president, before being named the U.S. Ambassador to Ireland by President Barack Obama in July 2009. Rooney has been a major figure in the National Football League (NFL), as his franchise has won six Super Bowls. 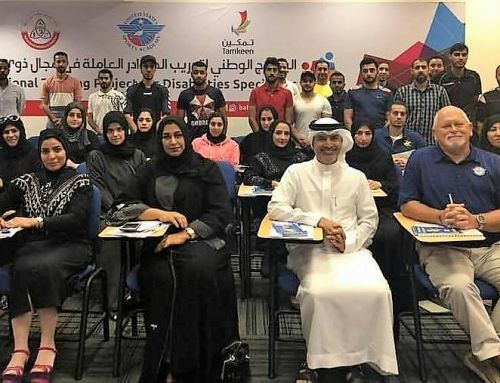 He played a significant role in the promotion of minorities in the sport, as a rule in his name requires teams to interview at least one minority for head coaching and senior football operations positions. He was named to the ambassadorship in large part because of his support for Irish-American charitable causes. Chantal Petitclerc is a dominant figure in wheelchair racing, having won five gold medals for Canada in each of the last two Paralympics — Athens in 2004 and Beijing in 2008. Petitclerc won races covering distances from 100 to 1,500 meters. In Beijing she set three world records and four Paralympic records. She has 21 Paralympic medals, including fourteen (14) golds. Her accomplishments inspired the Canadian Press to name her Female Athlete of the Year in 2008. The Samaranch Award is presented annually to a physically or mentally challenged athlete who displays courage, desire and athletic ability in the face of adversity to achieve the goals set forth in the athlete’s arena of competition. United States Sports Academy Board of Trustees member Dr. Linda Moore, the senior director of business administration for ESPN, presents a Distinguished Service Award to University of St. Francis baseball coach Gordie Gillespie. Bobby Bowden is walking away from coaching the Florida State football program as a living legend. He leaves the game after 44 seasons as a head coach at Samford, West Virginia and Florida State, where he will be best remembered for turning the Seminoles into a major collegiate power during his 34 seasons. Under Bowden’s guidance the Seminoles had a streak of 14 straight top-five finishes in the Associated Press poll, and won more than 85 percent of their games. He finished with 389 career victories and 33 straight winning seasons. Kevin Carroll has worked with a number of Paralympians who participated in the Beijing Games in 2008 and has customized prosthetic solutions for a number of individuals. One client, a double-leg amputee, has climbed Mt. Kilimanjaro. 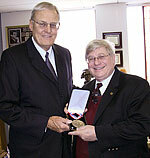 His research and clinics have educated others and helped many disabled athletes over the years. Gordie Gillespie shows no signs of slowing down at age 84. College baseball’s winningest coach with 1,816 victories will begin his 58th season in April. More than twenty (20) seasons have come with his current team, the University of St. Francis in Joliet, Ill. Gillespie is in his second stint at St. Francis. He coached there from 1977 through 1995 and returned in 2006. Gillespie has been inducted into sixteen (16) halls of fame, including the College Baseball Hall of Fame last summer. United States Sports Academy Board of Trustee member Dr. Gary Cunningham, left, presents a Distinguished Service Award to Michael Josephson, the founder of the Josephson Institute of Ethics. Michael Josephson has impacted sports at the grass roots level with his “Character Counts” program, which gives coaches and parents the ability to build character and create champions in their youngsters.  His program “Pursuing Victory With Honor” sportsmanship campaign is endorsed by virtually every U.S. athletic organization. The program helps children address such topics as sports, healthy lifestyles and building character through sports. Robert Kanaby has devoted more than 30 years of his life to high school athletes. When he retires in May 2010 as the executive director of the National Federation of High School Association (NFHS), he will leave with participation numbers in high school sports at an all-time high of more than 7.5 million student-athletes. Philippa “Phil” Raschker has been declared the best athlete in the history of track and field in some circles, and even though she’s not a big-name celebrity, it’s easy to understand why. She’s set more than 200 world and U.S. records in senior track and field during her career. And it’s unlikely any track and field athlete can match what she did at the 2009 National Senior Games, when she competed in 11 events and won seven of them. She was even more impressive at the World Masters Championships in Italy, winning gold in all 10 events she entered. United States Sports Academy President and CEO, Dr. Thomas P. Rosandich, presents a Distinguished Service Award to senior track and field standout Philippa “Phil” Raschker. Wallace “Wally” Renfro has been an employee of the National Collegiate Athletic Association (NCAA) for 35 years, rising to the position of vice president and senior advisor to the president. He has served the NCAA as a valuable resource with the media, having been quoted in newspapers and appearing for hundreds of television and radio interviews. He has also testified before Congress on issues related to college sports. University of Connecticut’s basketball team dominated the competition like no other team in the history of National Collegiate Athletic Association (NCAA) Division I history, male or female. The Huskies won the national championship with a perfect 39-0 record and beat all of its opponents by 10 points or more in the process, the first time that’s happened at the Division I level. The New York Yankees returned to the top of the Major League Baseball world, beating the defending champion Philadelphia Phillies in six games to win their 27th World Series championship. After missing the postseason for the first time in 13 years in 2008, the Yankees returned to the playoffs with a vengeance, behind a thunderous lineup, dominant starting pitching and the best closer in baseball history. The return to glory coincided with the Yankees opening up their new stadium across the street from the old, storied Yankee Stadium.